Towards The Center will be held on “2072/09/04”. We aim to resurface the moment where the tenor of earthquakes’ epicenter zones overcharged Nepal. Worldwide concern drained towards the epicenter areas where it originated one after another ravaging the socio-lives. National/International AID started flowing towards these centres. Barpak, Gorkha ,the most hit-zone needed the aid in tons. We look forward creating a robotic play-effort for transporting the aid towards the epicentre. Robots have to complete the maze constructed using boxes (40cm*40cm) on a 200cm*200cm base. Robots have to indicate the arrival to manual zone past the automatic zone by blinking/turn on a LED (a white line indicates the switch through between zones). The robot has to pass through a small village i.e.Thakre and cross 4 bridges i.e.Baireni, Benighat,Manakamana and Jaubani. Aid-Packages (47mm*40mm*10mm) should be dropped in 5 places (Maximum of 4 packages at a place). Thakre and First bridge(Baireni) are compulsory. The bridge of the zone would be fixed. If the package is not dropped in this region, the robot would not be awarded by any points. Triggering of the light ends the game only if both the robot enters region#3 or if gameplay time exceeds. Two robots will compete in the game arena at a time. The packages should be loaded manually(by the player) before the start of the game. Maze will be designed using boxes of 40cm*40cm on a 200cm*200cm base. In case of failure to complete the maze, the robot will be allowed to go to next region only after 90 sec with deduction of certain points (only in the League round). A white line denotes the switch between the automatic and manual zone. Robot has to indicate this by switching ON the led on the robot. In case of failure to turn on the LED, the participant will be allowed to use android mobile with deduction of certain points. Packages should be dropped within the specified boundary(packages touching the boundary will not get any points). Drop regions: Thakre, Baireni and Barpak are compulsory. Triggering of the lights at Barpak, ends the game only if both the robot enters region 3 or if gameplay time exceeds. Each triggering and dropping of packages add up extra points to the team(10 cm above the bridge plane). Completion of Automatic zone gives 60 points(failure to complete the maze deducts extra 40 points). Turning on the LED ON the robot adds 20 points(failure to turn on LED will deduct extra 20 points). Completing of the bridge doesnot give any points (except for Region 3). Here the participants can drop minimum 1 package and maximum 4 packages which consists of 10 points each. Turning the lights on will give 30 points. Turning the lights on will give 40 points. Bridges will already be completed so the participants only need to drop a package (compulsory) which consists of 30 points. Triggering the switch adds 50 points(Compulsory to end the game). The whole game should be completed within 3 minutes of time. The robot will be allowed to enter the boundary of Thakre village only. The robot cannot go back to the previous zone once it has reached a new zone. Organizers will not be responsible for any minor scratches left by previous robot. Only one member from a team can be in the game zone. Any team not ready at the specified time will be eliminated from the competition. Judges’ decisions shall be treated as final and binding. Signal jammer of any type cannot be used. 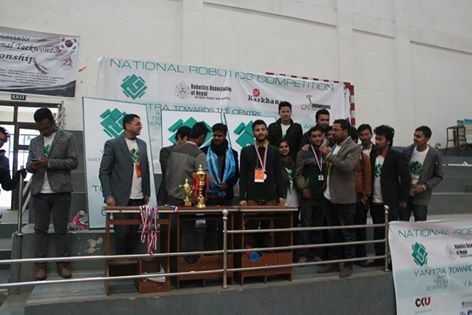 Participants should not dismantle their robots before the completion of the whole competition. Any robot not conforming to the specialization provided. The team damaging or tries to damage the Game Field. The team performing any act that is not in the spirit of fair play. The team that fails to obey instructions and/or warnings issued by the referees. The use of explosives, the fire and dangerous chemicals. The use of android apps and its design is only allowed to control the robot manually. The android apps needed to control the robot manually cannot be downloaded from any of the apps store. The team using any type of signal jammer. Winner will be decided according to the points obtained. If any one robot triggers switch of the epi-central zone before another robot appears in the epi-central zone, the game will end only when another robot enters the epi-central zone or if game play time exceeds 3 mins. Triggering of the light ends the game only if both the robot are at region3. If the match is draw; robot triggering the switch of Barpak(Region#3)will win the game. If the match is draw; and none of the robot triggers the switch of the central zone, then the robot with minimum weight will win the game. 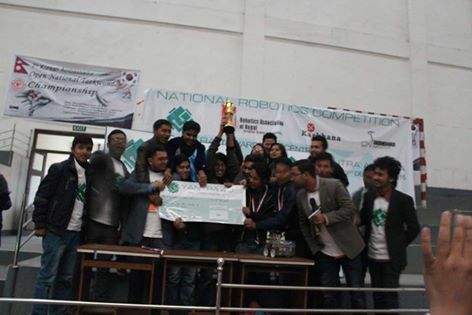 The robot may be checked for the verification, any time throughout the event as according to the desire of jury team, organizing team or the opponent. A team may consists of a maximum of 4 members .Students from different educational institutions can also form a team. Anyone interested in robotics can participate in the event.However they have to submit a valid identity card and a passport sized photo. All participating team members will be provided with a certificate of participation. If any team is sponsored by college or any organization, college or organization will also get the certificate of participation. For which team needs to verify the name of their sponsors (if any) during the time of registration.